This week I have decided to have one my “theme” weeks. A week is just about the extent of my attention after which I tend to get bored and drift off into some other random ramblings. I hope I am not being over ambitious. At first I considered a “rainbow” week, seven colours, seven days, they were made for each other. Then I realised that this may be a little problematical as I have never been quite sure of the difference between indigo and violet, and blue can even be a little dodgy. So the week’s subject is going to be purely “colour” or more accurately, because I find it impossible to use one word when two will suffice, “colour scene”. Today is the turn of Orange, a hue that evokes much opinion. Personally I love it. 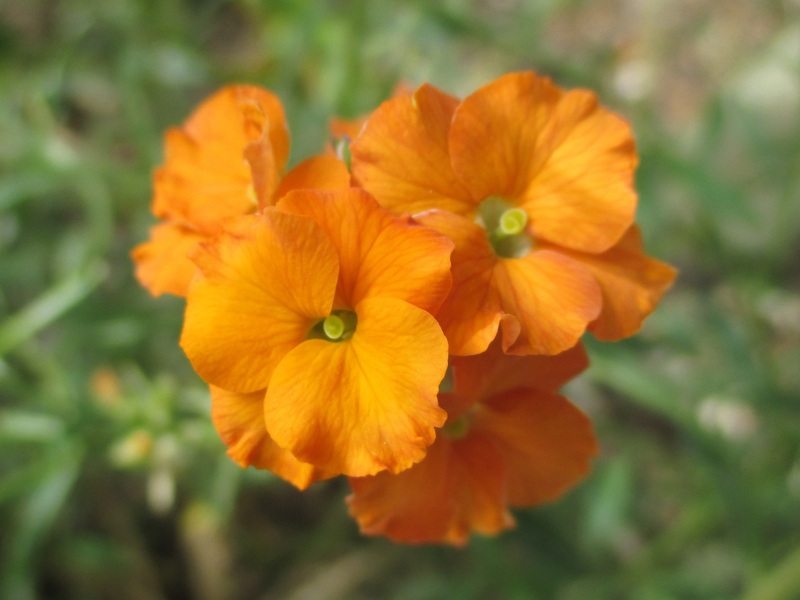 Although this perennial wallflower is called Erysimum “Apricot Twist” to my mind it is as orange as, well an orange. What a good idea! What will you do for black? grin. That will be a challenge, and may be open to interpretation ……. Which is a very nice dream! I’ve seen plenty of oranges in the supermarket that weren’t nearly as delicious-looking as your wallflower! Ha! You are quite right it is delicious and has been flowering for weeks. A beautiful shade of orange, I can imagine that planted with some Geranium ‘Orion’ in all its blueness and some golden leaved oregano. Orange flowers are the essence of summertime.